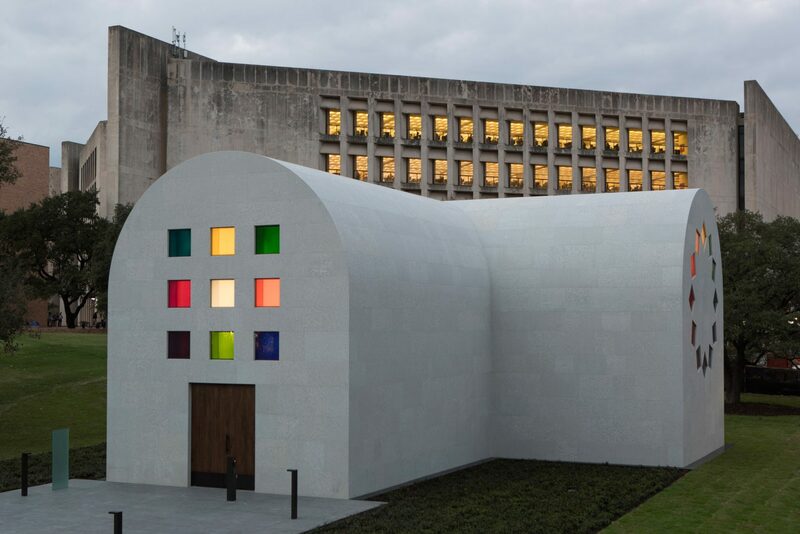 A pavilion with colourful geometric windows by late American artist Ellsworth Kelly has been built at the University of Texas in Austin.The pavilion, titled Austin, is the first and only freestanding building designed by Kelly, who is renowned for his colourful and minimalist artworks. Based on a sketch he made of a chapel in France during a stay between 1948 and 1954, the idea for the work gradually became three-dimensional as he worked on it during his lifetime. Kelly eventually gifted the design to The Blanton Museum of Art at the University of Texas in Austin, which fundraised $23 million (£16 million) to complete the fabrication of the structure. “After Ellsworth Kelly gifted the building design to the Blanton in 2015, the museum began working to realise Austin, one of Ellsworth Kelly’s last works, and certainly one of his greatest,” said the museum. Although modelled on a chapel, the structure is designed as a place for joy and contemplation, rather than with a specific religious programme. Measuring 2,715 square feet (252 square metres), the pavilion is built from pale-coloured stone. Its cross-shaped plan’s four wings are each topped by a smooth arch, and three are fronted with flat walls.Large colourful window designs characterise the otherwise minimalist structure, with geometric patterns enlivening its south, west, and east facades. The entrance is defined by a grid of nine colourful square windows above a double door. Bright green, maroon, aqua, pink and cobalt are some of the hues used.To the east and west feature circular formations, both with twelve differently coloured windows. The windows mirror each other in the placement of their colours, and their designs resemble both clock faces and colour wheels. A spiral made from thin strips of coloured glass is incorporated into the west facade. A thin golden yellow window marks noon, with sky blue at three o’clock, purple-black at six, and deep red for nine. On the east facade, each of the twelve points are made with small titled squares, creating a circular outline. Upon entering is a dark, intimate space illuminated by a rainbow of natural light filtered by the various windows. Walls are kept white throughout and match the exterior, while dark grey floors also help to keep the space minimal. A series of square monochrome paintings made on marble panels line the interior. These hanging artworks contrast with the vibrant window designs, but are similar in their geometric simplicity. Inside the windowless wing facing north facade is a totem made from redwood. The tall timber sculpture stands as the surrounding walls arch above towards the rounded ceiling. The building opens 18 February 2018 in conjunction with an exhibit at the museum — Form into Spirit: Ellsworth Kelly’s Austin — which will include a section about his use of the colour grid. A 1967 painting by Kelly called Form into Spirit’s Spectrum IV will be loaned from New York’s MoMa for the show.